This Large PFC Oval Table and Chairs Cover fits oval tables up to 108 inches length by 82 inches width and six standard chairs. The click-to-close straps lock around the legs to secure the cover on windy days. Along with an adjustable elastic hem cord for a tight, custom fit, it features front and back handles for easy fitting and removal. This ultra-durable cover will not crack in cold weather, and the featured air vent reduces condensation and lessens ballooning in high winds. 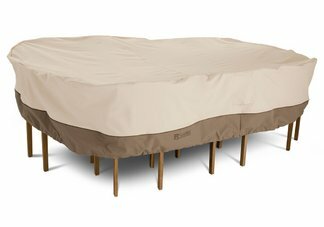 This Large PFC Oval Table and Chairs Cover has a three-year warranty and is guaranteed by the Gardelle Fabric Protection System.